The ASTP covers sent to the US NAVY for postmarking actually did NOT go to the USS New Orleans, EXCEPT for the one shown below, postmarked on July 25, 1975. This is the first day the post office on the ship was open. See below. 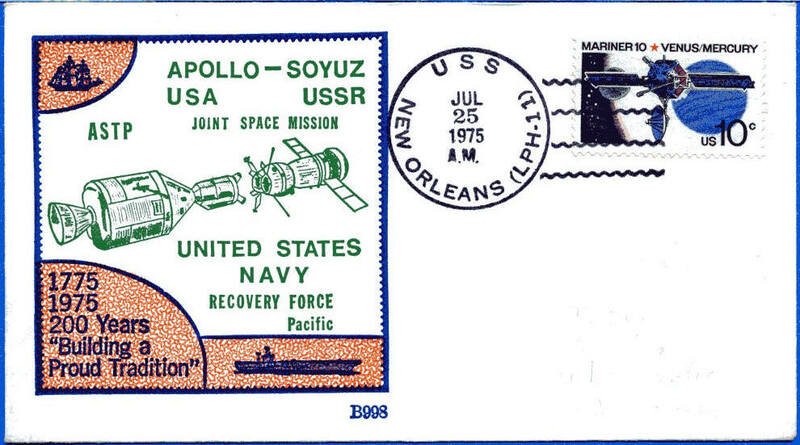 The significance of the Beck cover shown here is that it WAS on board the USS New Orleans during the recovery to receive this specific postmark. Beck printed a few extra envelopes for the Navy and a couple of dealers. A few of those covers found their way to the ship, instead of Hawaii. They were either hand carried by someone in the media or a member of the Navy crew. They also could have been mailed directly to a crew member of the ship for postmarking as reported by Dr. Ramkissoon. Please refer to Ray Cartier’s excellent book on recovery ships for more information on the other covers for this event. The cover shown here is a Morris W. Beck cover and this cover is a very important cover for Beck collectors. We have only seen a few examples of this cover and estimate the value of this cover to be $150 or more. It could easily sell for more on eBay once space collectors realize what its significance is.